The two-door Evoque will be the smallest, lightest and most fuel-efficient vehicle in the Land Rover lineup. Land Rover has taken the wraps off its new small SUV -- the two-door Range Rover Evoque -- as it makes a bid to appeal to fashion-conscious urbanites. The Evoque maintains virtually all the styling from the LRX concept that previewed it two years ago. The example shown at an unveiling in England on Thursday appeared to be slightly smaller than the concept. Land Rover gave few details about the Evoque and did not show the interior. A full introduction is planned for the Paris auto show in late September. It goes on sale in Europe next summer and in the United States in late 2011. 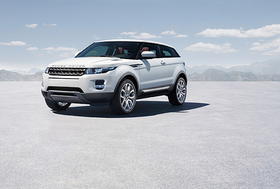 The Evoque is the smallest, lightest and most fuel-efficient vehicle in Land Rover's lineup. It uses the Land Rover Freelander platform as its starting point, but is significantly re-engineered. The Evoque and Freelander share less than 30 percent of their platform components. Land Rover Managing Director Phil Popham said the Evoque will be built at Land Rover's factory in Halewood, Merseyside, northwest England, creating 1,000 new jobs. He said the Evoque will open the brand to a new group of customers who may not have considered buying a Range Rover. Land Rover would like 50 percent of Evoque buyers to be female. Company executives were coy about interior details. The Evoque is expected to have seating for four people, and possible five with a reconfigured back seat. The back seat will also fold flat to increase cargo room. Four-wheel drive will be part of the package but off-roading is not the primary mission of the Evoque. In keeping with the fashion design brief, Land Rover is working with model and former pop singer Victoria Beckham. She will be a consultant/advisor to the company. The Range Rover Evoque was rolled out as part of a 40th anniversary celebration of the Range Rover line.